The Shūyuàn (书院), usually known in English as Academies or Academies of Classical Learning, were private research and educational institutions in ancient China. They were built as early as the eighth century and flourished during the tenth and eleventh centuries with the support of various Emperors. The Shuyuan were not only centers for the compilation and study of classical literature, but were crucial for the development of Confucianism and Neo-Confucianism; notable Confucian thinkers such as Zhu Xi and Wang Yangming developed their ideas and taught at the Shuyuan. The Shuyuan declined during the Yuan Dynasty (Mongol), but were revived during the Ming and Qing dynasties; some became universities, middle schools, museums, and libraries during the late Qing dynasty. One in particular, the Yuelu Academy, was established in 976 C.E. and still exists today as Hunan University, otherwise known as the "one-thousand-year-old academy." The shuyuan originated in 725 C.E. during the Tang dynasty. They were places where scholars could teach and study the classics, and where books collected from around the country could be preserved. By the late Tang dynasty, private academies had appeared all over China. During the Northern Song (960-1127 C.E. ), many academies were established with government encouragement. Each academy had its own teaching and administrative structure and was economically independent. Besides signboards, emperors also bestowed books. In 977, the Taizong Emperor bestowed on the White Deer Grotto Academy a copy of the Nine Confucian Classics printed by the Guozijian. The Yuelu Academy, the Songyang Academy and other academies also received books from the Emperor on a number of occasions. However, academies had begun to decline by the twelfth century. The White Deer Grotto Academy, which had fallen into ruin, was rebuilt by the prominent neo-Confucianist Zhu Xi in 1179-80 during the Southern Song dynasty and reopened in 1180. It became an important center of Confucian thought during eight centuries. Zhu Xi himself taught here during the Southern Song as did Wang Yangming during the Ming. As a result of Zhu Xi's efforts, the shuyuan became a permanent feature of Chinese education, taking up major responsibilities of local education. The system of academies was dismantled under the Yuan (Mongol) Dynasty (1271-1368 C.E.) and all academies were placed under government control to become preparatory schools for the Imperial Examinations. However, the system was revived under the Ming (1368-1644 C.E.) and the Qing (1644-1911 C.E.). In the Ming dynasty, academies devoted to discussing political issues appeared, such as the Donglin Academy, often resulting in political repression. According to one study, 40 percent of the 1239 known Ming academies were built during the Chia-ching era (1522-1566 C.E.). During the Qing dynasty, thousands of academies were created for the purpose of preparing students for the Imperial Examination, although there were still some that functioned as centers of study and research. The academies were finally abolished under the Hundred Days' Reform in 1898 at the end of the Qing dynasty. There were more than 7,000 Shuyuan academies recorded. In the late Qing dynasty, some of the Shuyuan became universities, middle schools, public libraries and museums. In Korea, which also adopted Confucianism, the shuyuan were known as Seowon. In the late Qing dynasty, schools teaching Western science and technology were established. Many such schools were called Shuyuan in Chinese. Despite the common name, these shuyuan are quite modern in concept and different from traditional academies of classical learning. In discussing the shuyuan, it is common to speak of the "Four Great Academies" (四大书院) of ancient China. While the "Four Great Academies" usually refer to the Four Great Academies of the Northern Song, there are a number of variations depending on the source. Sometimes the list is expanded to Six or Eight Great Academies; only the Yuelu Academy appears in every list. The Yuelu Academy (also as known as the "Yuelu Academy of Classical Learning," Simplified Chinese: 岳麓书院; Traditional Chinese: 嶽麓書院; pinyin: Yuèlǔ Shūyuàn) is located on the east side of Yuelu Mountain in Changsha, the capital of Hunan province, China, on the west bank of the Xiang River. 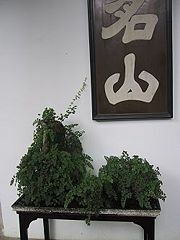 It was founded in 976, the 9th year of the Song Dynasty under the reign of Emperor Kaibao. The Confucian scholars Zhu Xi and Zhang Shi both lectured at the academy. The Academy, which has survived the Song, Yuan, Ming and Qing dynasties, was converted into the Hunan Institute of Higher Learning in 1903. It was later renamed Hunan Normal College, Hunan Public Polytechnic School, and finally Hunan University in 1926. The Academy has witnessed more than a thousand years of history, so Hunan University is also known as "one-thousand-year-old academy." Today, Hunan university's Chinese language and classical studies department is one of the best research centers for the study of Chinese classics. An interior courtyard of the White Deer Grotto Academy, August 2005. The White Deer Grotto Academy (Simplified Chinese: 白鹿洞书院; pinyin: Báilùdòng Shūyuàn, sometimes translated as White Deer Cave Academy or White Deer Hollow Academy) was located at the foot of Wulou Peak in Lushan, now in Jiujiang, Jiangxi province. It was one of the Four Great Academies of China. 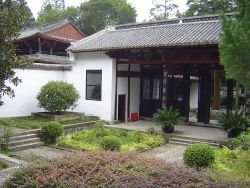 The academy was established as a place of learning by the Tang Dynasty poet Li Bo (李渤 Lǐ Bó, d. 831 C.E., not to be confused with the more famous Tang poet Li Po or Li Bai) when he was living in retirement. Because Li Bo kept a white deer, he was known as the White Deer Teacher and the school as the White Deer Grotto. Between the years 937—942, when the area was under the control of the Southern Tang, a school was officially established here under the name "Lushan Guoxue" (庐山国学, meaning "Mount Lu National School"). In the early years of the Northern Song dynasty, which began in 960, the Lushan Guoxue was transformed into an academy, known as the White Deer Grotto Academy. The academy was the recipient of imperial favour from the Emperor Taizong (r. 976-997 C.E. ), who bestowed on it books and awarded official rank to the academy's head. However, it later fell into disrepair. In 1179-80, during the Southern Song dynasty, the academy was rebuilt and expanded by Zhu Xi, later to become the most preeminent of the neo-Confucianists. Zhu Xi, who was serving as prefect of Nankang Prefecture (now Nankang City), rebuilt the academy based on the layout of the Temple of Confucius at Qufu. The new academy opened its doors to students and scholars in 1180. It was involved in instruction, the collection and preservation of books, religious devotions, the development of curricula, and lectures by famous scholars, including such notable names as Lu Jiuyuan, Lü Zuqian, and later Wang Yangming. The academy continued to flourish for eight centuries. The rules of the Academy as set down by Zhu Xi had a profound and lasting influence on the subsequent development of Confucianism. The Donglin Academy (東林書院 Dōnglín Shūyuàn—literally meaning "Eastern Grove Academy"), also known as the Guishan Academy (龜山書院 Guīshān Shūyuàn), was originally built in 1111 during the Northern Song (北宋) dynasty at present-day Wuxi in China. 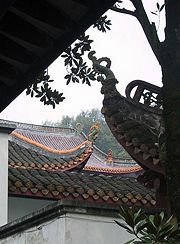 It was originally a school where the neo-Confucian scholar Yang Shi taught, but later fell into disuse. In 1604, during the Wanli era, Gu Xiancheng (顧憲成 Gù Xiànchéng, (1550-1612 C.E. ), a Ming Grand Secretary, along with Gao Panlong (高攀龍 Gāo Pānlóng, 1562-1626 C.E. ), a scholar, restored the Donglin Academy on the same site with the financial backing of local gentry and officials. The academy gave its name to the resulting Donglin movement. Also known as the Four Great Academies of the Northern Song or the Four Northern Song Academies. Sometimes the Shigu Academy is substituted for the Songyang Academy. (An alternative list of "Six Great Academies of the Northern Song" contains the same academies in a different order). ↑ Thomas H. C. Lee, Education in Traditional China: A History (Leiden: Brill, 2000, ISBN 9004103635), 100. Taga, Akigoro. The History of Education in T'ang China: Todai Kyoikushi No Kenkyu. Osaka: Osaka University Press, 1985. This page was last modified on 24 April 2018, at 19:38.